Below are tools and kits that may be needed when installing a cable railing system. Cable Crimpers are used to hand swage field assemblies onto cable. 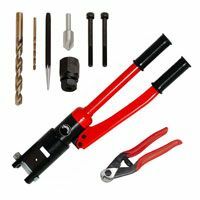 This tool is required for most of our assemblies unless you order Swageless Assemblies or choose to have us professionally swage the fittings for you prior to shipping. Cable cutters are recommended for any project to assure cable length precision, but are especially necessary if field swaging. Our installation kits contain drill bits and other common tools and screws used to install our systems which aren't automatically included with their associated products.